Orkney RFC’s Kyle Robb during a recent win over Carrick. 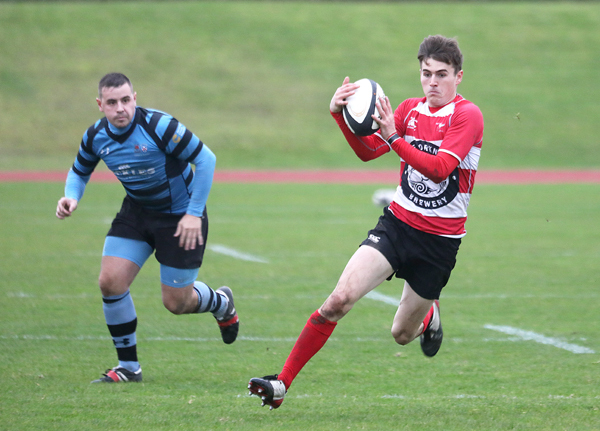 Orkney RFC will aim for a third consecutive win this Saturday when they take on Hillhead Jordanhill. There is little between the sides — one point separates the two in the Tennent’s National League Division 3 — however, Orkney will go into the fixture full of confidence following back-to-back victories against Carrick and Haddington. It is an early kick-off at Pickaquoy with the action beginning at 11.30am. Meanwhile, Orkney’s hockey and football sides are both on their travels. The senior ladies hockey side return to Scottish District Cup action, taking on Livingston and West Lothian. The second-round match is set to take place in Inverness at Bught Park, with pass-back set for 1.15pm on Sunday. Orkney FC are preparing for their sixth consecutive away tie on Saturday, as they look to end Golspie Sutherland’s perfect start to the season. The North Caledonian League defending champions travel south to take on a Sutherland side with four wins from four in a 12.45pm kick-off. In badminton, a highlight of the local season, the Orkney Crystal Open Championships is set to take place at the KGS. The singles will begin tonight (Friday) at 5.30pm with the doubles and mixed doubles set to start from 9.30am on Saturday. It’s a busy weekend for Orkney’s swimming club, with four swimmers travelling to Aberdeen to take part in the North District Open. A high level meet attracting top swimmers from throughout Scotland, Angus Blance, Emma Henderson, Jean Blance and Dan Kirkpatrick will compete. A squad of 13 swimmers are also set to travel to Wick on Saturday to compete for the Gibson Cup. Finally, weightlifter Matthew Byers is set to compete in the Scottish Open Championships in Edinburgh on Sunday, while also on Sunday, the Orkney Clay Pigeon Club will be hosting a fun shoot as the club bids to raise funds for the Longhope Lifeboat Museum Trust with everyone welcome.